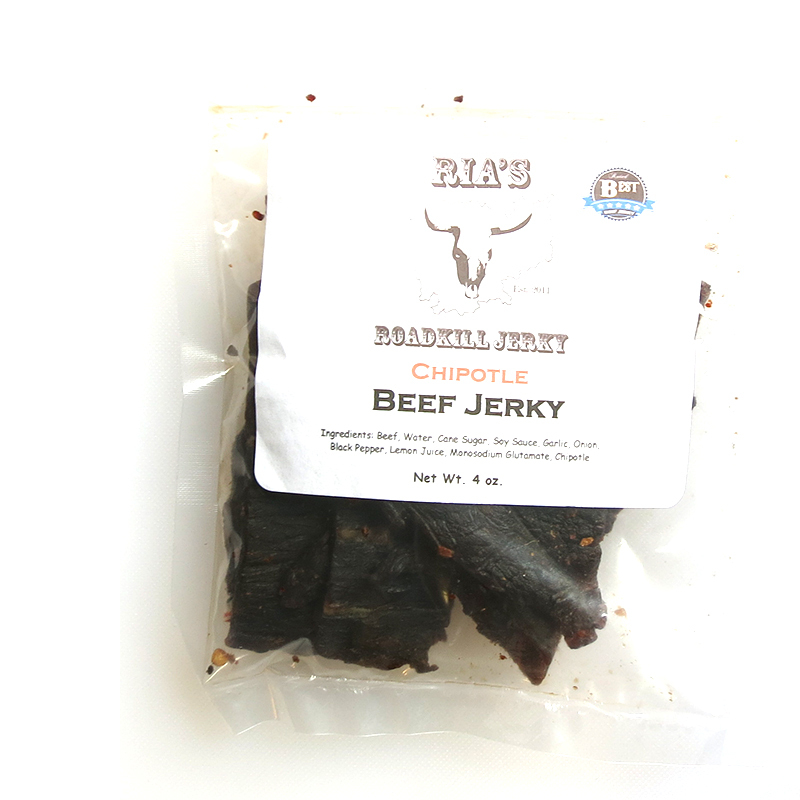 Next in the series on Ria's RoadKill Jerky is this Chipotle beef jerky. See previous reviews of Ria's RoadKill Jerky. Ria's RoadKill Jerky is run by Eden Van, based out of Long Beach, CA, having launched in January 2011. Eden got started in making jerky after receiving compliments on his barbecue recipes. He uses USDA Choice top round from his local meat market. All jerky is dehydrated in a smoker. He currently sells through Facebook and eBay while waiting for his new website to finish. 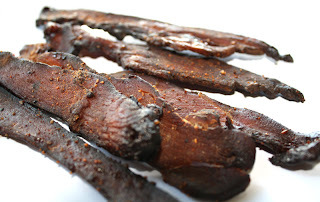 According to Eden, this Chipotle beef jerky is the same as his Original beef jerky, but with chipotle seasoning sprinkled before hitting the smoker. Lawless Jerky Cyber Monday Sale! Lawless Jerky has you covered for the holiday season! 100% grass-fed beef jerky and 100% pasture-raised pork jerky in amazing, 5-star flavors are the perfect small gift or stocking stuffer. Lawless Jerky is America's Craft Jerky. A true craft brand that combines traditional techniques and modern creativity. We handcraft our jerky without artificial additives or preservatives, generating more interesting and more intense flavors with no sugary coatings. Sale starts at 12:01am on Monday morning through midnight. Buy 5 pounds or more and receive a FREE Jerky Jar. Free shipping on orders over $40.00. A flat rate of $2.00 for shipping on orders under $40.00. Sale starts at 8:00 AM eastern time Monday morning and runs till 9:00 PM eastern time. Try "real wood smoked" jerky, instead of the liquid smoked stuff you find in stores! You won't believe how great it tastes! The samplers make great stocking stuffers that everyone is sure to go crazy about. Give the gift of Crazy Good Jerky!!! Earlier this week, the World Health Organization (WHO) reported that processed meats cause cancer and that red meats may cause cancer. By captivating the public’s imagination with headlines worthy of a doomsday “meatpocalypse,” some media outlets have unfairly taken aim at the entire category of beef jerky as a “processed meat” potentially implicated by these findings. As detailed below, this is sloppy reporting which seeks to get a cheap rise out of the public by attacking a beloved morsel of Americana. In considering these findings, we must remember that not all beef jerkies and not all red meats are created equal; thus, not all beef jerkies and not all red meats should be implicated by the WHO findings. As a disclaimer, I clearly have a horse – err cow? – in this race. 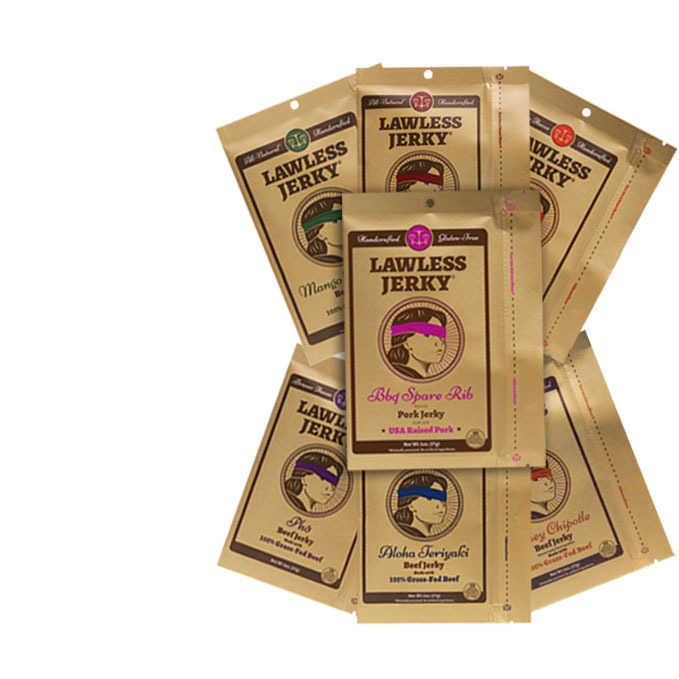 Following a recall of Krave Jerky in 2014, in which cows with cancer were made into a purportedly gourmet jerky, I decided that my company, Lawless Jerky, would craft our jerky exclusively with 100% grass-fed beef. We take great effort and expense to produce truly premium jerky in gluten-free and all-natural flavors, and I resent our product being lumped together with old school “processed” jerkies that still add nitrites and preservatives. It is critical that we beef jerky lovers think a little bit more about what the WHO report said…and what it didn’t. Even in the original IARC press release, which gave rise to the media’s feeding frenzy, Christopher Wild, Director of IARC, asked that people consider the positive nutritional value of red meat. In a same-day retort to the press release, “How bad is meat for me? Frankly, the experts don’t know,” health editor Sarah Boseley pointed to the misleading and hyperbolic notion that consuming processed meats and smoking cigarettes carry the same health risks, which leads us to stress that moderation is key and to caution against lumping all processed or red meats into a single category. Unfortunately, the WHO report linked cancer to processed meats without going into detail about which specific part of the processing was found to be the cause of increased cancer rates. There is a significant difference between large-scale, conventional curing processes (which add sodium nitrites) and the processes used by more ingredient-conscious companies like Lawless Jerky. While the largest beef jerky processors still use nitrites and added preservatives, the undeniable trend in beef jerky is to move AWAY from the unnatural chemical additives commonly found in mass-produced sausage, ham, and bacon products. Moreover, the report less conclusively suggested that red meats may cause cancer. By grouping all red meats into one category, the study fails to even consider differences in the ways in which animals are raised, an established and important difference between red meats. The old axiom “you are what you eat” is as true today as ever, and it equally applies to the animals that we eat and the foods that they consume. For example, there are widely accepted and significant differences between grass-fed beef and “conventionally raised” beef. From a nutritional standpoint, the omega fatty acid ratios (good for the heart and brain) are far more ideal in 100% grass-fed beef than in grain-fed, factory-farmed beef (MayoClinic). Moreover, the amount of heart-healthy CLAs (conjugated linoleic acid; a type of fat believed to decrease the risk of heart disease and cancer) is greater in 100% grass-fed beef (MayoClinic). 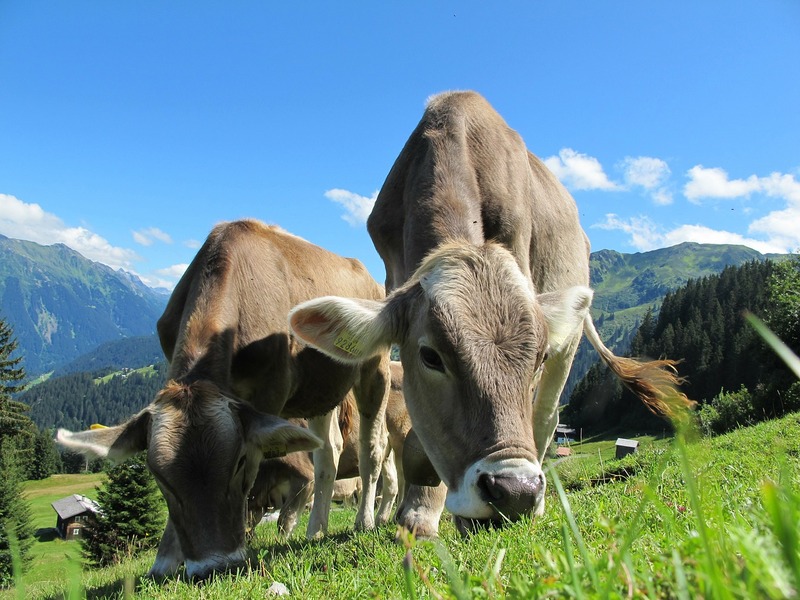 From an ethical standpoint, bovine left free to graze in pastures, eating the food nature intended for them, should be distinguished from the unnatural “conventionally raised” cows, which are plumped with a man-made diet of corn, soy, and antibiotics, which seek to combat illnesses associated with the horrid conditions found on factory farms. In sum, failing to distinguish how various red meats are raised is a critical misstep in the purported link of red meat to cancer. For an increasing number of consumers, 100% grass-fed beef stands for better health, nutrition, ethics, and, ultimately, quality. Just this month, the cover story of Consumer Reports (which strongly recommends 100% grass-fed beef as being worth its premium price) showed another, less frequently discussed way that 100% grass-fed beef is different and better: 100% grass-fed cows are 3 times less likely to harbor superbugs, strains of multidrug-resistant bacteria. The further our food gets away from how it evolved over time in nature (i.e. cows evolving as plant, not grain, eaters), and the more foreign substances that we introduce into our bodies (i.e. ingesting chemicals not found in nature), the more we run the risk of our bodies rejecting these choices (i.e. cancer). It is my hope that the millennial generation continues to champion the slow food movement and getting away from the “quantity over quality”, “convenience/cheapness over all else” mindset that has left so many children and adults victims of diabetes, heart disease, and other diseases of Western Civilization.